A history of the Irish Republican Army, published Monday, describes Gerry Adams as the IRA's longest-serving commander - and the mastermind behind a two-decade effort to steer the underground group toward cease-fires and political compromise. "A Secret History of the IRA," written by one of Ireland's most respected reporters, Ed Moloney, says Adams joined the IRA's ruling Army Council in 1977 and sanctioned the secretive group's worst atrocities as he led its legal Sinn Fein party. 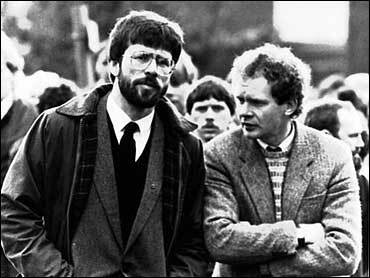 Adams, Sinn Fein chief since 1983, insisted he was never an IRA member and said the book repeated old allegations. "This story has been peddled for ages now," Adams said. "Let me categorically deny the allegations of my involvement in the IRA." Moloney, a Northern Ireland specialist since 1978, said Adams deserved the Nobel Peace Prize for his efforts to keep control of the IRA. He said Adams coaxed the IRA toward the 1998 peace accord that set up a four-party government of British Protestants and Irish Catholics, including Sinn Fein. "Some people might find Adams a deeply unattractive character, not someone you would want your daughter to marry. But there's absolutely no doubt the guy is a strategic genius without whom there would have been no peace process," Moloney said in an interview. The author also identifies Sinn Fein deputy leader Martin McGuinness as a member of the IRA's ruling Army Council from 1977 to the present day. McGuinness, who has acknowledged he was once an IRA commander, is Northern Ireland's education minister. Protestant hard-liners opposed to including Sinn Fein in the government said Monday they would try again to have McGuinness kicked out of office. Previous efforts to expel McGuinness didn't muster enough support from Catholic lawmakers. The book also describes secret IRA meetings in the 1990s, when Adams allegedly outmaneuvered critics of his truce-and-talks agenda by telling rank-and-file members they could resume attacks if negotiations didn't go their way. The critics were outvoted and resigned in 1997, founding a rival IRA group that the Irish media dubbed the Real IRA. That group committed Northern Ireland's deadliest atrocity, the 1998 car-bombing of Omagh that killed 29 people, and continues to mount occasional attacks. Adams began sounding out terms for an IRA cease-fire a decade earlier than previously believed, using Belfast priest Alex Reid in 1982 as a conduit to Ireland's then-prime minister, Charles Haughey, and later to British officials. As a member since 1977 of the IRA's ruling Army Council, Adams sanctioned some of the IRA's most horrific attacks, including the 1978 La Mon House Hotel bombing that killed 12 Protestants and the 1993 Shankill Road bombing that killed nine Protestants. As Belfast Brigade commander in 1972, Adams created two secret intelligence cells within the IRA called "the unknowns," responsible for rooting out and killing informers and spies. Moloney said one of these units killed a single Belfast mother of 10, Jean McConville. An informer wrecked the IRA's most important arms-supply channel with Libya after four secret shipments of weapons reached Irish shores in the mid-1980s. The seizure of a fifth boat carrying 150 tons of arms forced the IRA to abandon plans for a Tet-style offensive in favor of an eventual cease-fire. Moloney said Adams refused to cooperate during the writing of the book, but scores of other IRA members did. Moloney offered specific dates for Adams' IRA career, saying he held the IRA's senior post, chief of staff, from December 1977 until he was arrested in February 1978 over the La Mon House attack. Moloney said Adams' ability to retain control of the IRA was good news for Northern Ireland peacemaking. He said Adams "demeans himself" by continuing to deny his IRA role long after such an admission would have meant a prison sentence. "He's risen to the top of the IRA and stayed at the top for nearly a quarter of a century. To stay at the top of this greasy pole requires very special skills, ruthlessness being one of them," Moloney said. "A Secret History of the IRA" is published in Britain, Ireland and Canada by the Allen Lane division of Penguin and in the United States by W.W. Norton.